We’ve had all kinds of critters visiting and exploring our yard over the years; some of them welcome and some of them not so welcome. Of course the raccoons are the least desirable of all the creatures that pass through here because they kill chickens, but most recently it was the neighbor’s dog that gave us the biggest scare. He got loose and attacked Applesauce, my Americauna hen. I thought she was a gonner at first because she ran under the deck and just lay there not moving for a good half hour. Then when my roommate, Brenda, and I were sitting in the house grieving her loss, Brenda looks up surprised and says “Isn’t that Applesauce?” Sure enough, there she was just meandering up the walkway towards the house as if nothing had happened. The dog managed to pull out a few feathers from her back area, but other than that she seemed fine and healed up pretty quickly. My neighbor, Jim, who has taken a liking to her, was so upset that he called the police to complain about the dog. I thought that was a little extreme, but I appreciated the concern. The neighbor never let that dog run loose again, so it must have had an impact. The animals I dislike the most right now are the neighborhood cats. I miss the days when my cat Zipper used to defend our territory and keep other cats at bay. She was such a good kitty. Now if the cats were friendly and sociable I might feel more welcoming towards them, but they are all anti-social and sneaky. I am sure they can feel the energy of my anger towards them, because whenever they see me coming towards them they high tail it out of there in fear. Cats poop everywhere in my garden, and that is just simply not an endearing quality. If I could make the cats disappear, I would! When they are new to the neighborhood they like to stalk my hens too, which of course makes my hens nervous. Eventually the cats all learn that it’s better to just coexist, especially since the hens are usually bigger than they are anyway. Recently, two of the neighbor’s cats discovered how comfortable the hen house was, so they started to hang out there and take cat naps. I could smell cat pee in the hen house so I knew they were taking up residency there. No wonder Applesauce has been avoiding her hen house. She didn’t want to roost in her nesting box when the damn cats had taken it over. I’ve since scared them out of there so she is safe again. In addition to the raccoons, cats, dogs, the neighbor’s rabbit, and the nutria I saw a few years ago (first photo), the next most annoying critters to take up residency on my property are the possums. 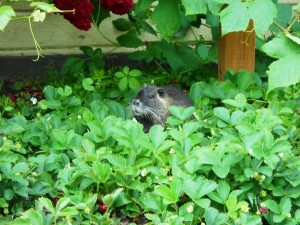 They are the strangest looking creatures the way they resemble rats and rodents, yet are as big as a small raccoon. They hiss and have very sharp teeth. They slither around like lizards yet can run really fast when they want to. A few weeks ago, Applesauce was on the front porch again around 10:00 at night while I was watching TV. I heard a big crash outside and Applesauce was screeching. I ran outside, expecting the worst, and there was Applesauce running out towards the street and that possum slinking away around the corner of the porch. On the porch was a soft egg. I think she scared it out of my poor hen! 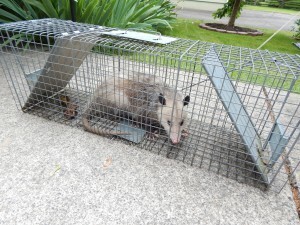 That’s when I knew that I needed to get rid of that possum or she’d get Applesauce and my new chicks if she got hungry enough. I borrowed the trap from some friends and it took about two weeks but I finally trapped her. Hurray! All I’m going to say now is that she is in a better place, and it’s not possum heaven. I would just call it a relocation resort. Unfortunately, as I had suspected, she left behind a couple babies; both about the size of a big rat. I am not sure if they were fully weaned yet, but apparently they didn’t have all the skills they needed to be on their own yet because we found one dead, and the other one still alive and scurrying around the garden a couple days later seeming somewhat disoriented. We tried various maneuvers to catch it but it evaded our attempts at first. Then about 20 minutes later we saw it in the strawberry patch sitting next to the little angel cherub. 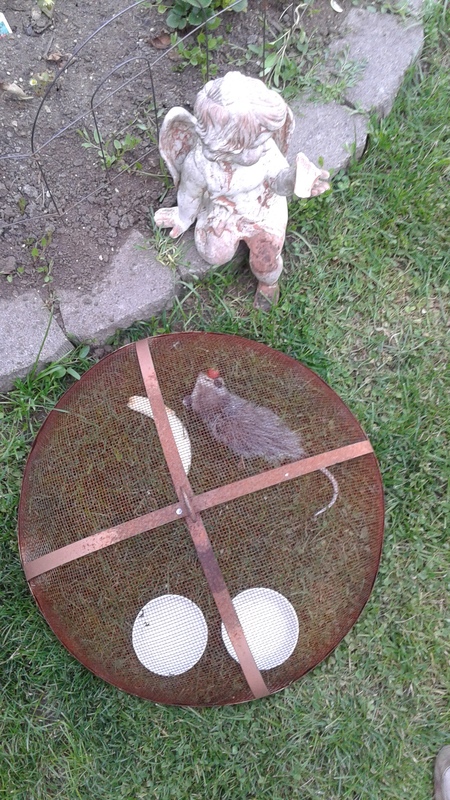 I took the top mesh cover of the fire pit and slowly set it down over the critter and kind of scooped it onto the grass. It seemed either very exhausted, or perhaps it was dying. I put some water and milk and a big banana inside the makeshift cage, and covered it with plastic to keep moisture off. I figured if it was okay the next day we could relocate her also but she didn’t make it to the next morning. Anyway, I fully understand that all these critters are just being as nature intended, and they have just as much right to spend time in my yard as I do. Humans have taken over the habitats of so many wild creatures, and they have to have some place to go. Now the domestic critters are a different issue. I do hold my neighbors responsible for keeping their domestic animals on their own property, but we all know that isn’t possible with cats, let’s face it. Dogs yes, cats no. 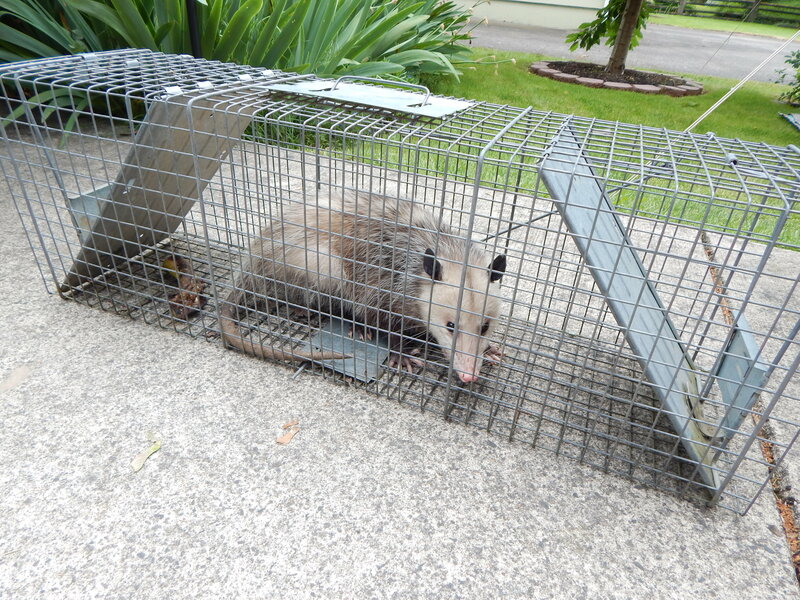 After my experience with the possums I felt I needed to find out more about these critters too. Here is one informative website I found.